A very pristine condition competition class early edition preferred clay Buddha amulet, Pim Song Krut Phii Suea Bua Koo, featuring a Buddha Riding on Garuda, from LP Ruesi Ling Dam. This Model is the Pim Phii Suea (Garuda with Butterfly Wings Model) Thaan Bua Koo (double Lotus Dais), Ud Pong Wised (Sacred Yantra Powder filled). 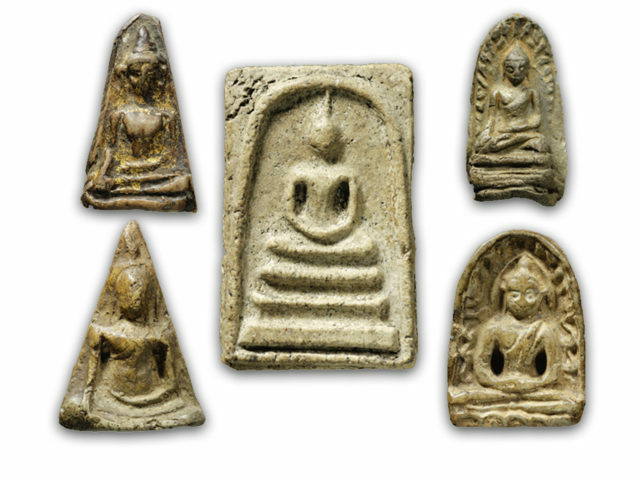 A Highly Sacred Clay Pra Kru Amulet of Preferred Class (Niyom), of the Great Luang Por Ruesi Ling Dam, of Wat Ta Sung, in Utai Thani. Luang Por Ruesi Ling Dam got his name from the fact that Luang Por Parn would call his three closest companions in the Sangha as 'Ling Khaw' (whit monkey), 'Ling Lek' (small monkey), and in turn, gave the name 'Ling Dam' (black monkey) to Luang Por Ruesi. The word 'Ruesi' was placed in front of 'Ling Dam', because Luang Por was a Ruesi Hermit Practitioner before he ordained as a Buddhist Monk (Bhikkhu), hence he gained the nickname of Luang Por Ruesi Ling Dam. The Pra Putta Jao Pratap Sadtw series was created using exactly the same formula as the original Wicha from LP Parn, who in turn received it from a mysterious Chee Ba Khaw. 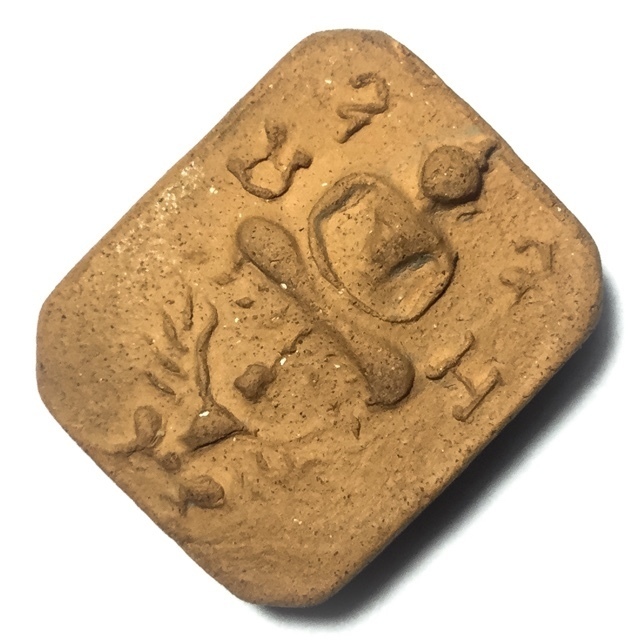 The complete Wicha was composed of six different Pim (at least those which are accepted as Pra Niyom preferred category amulets).They are found in various coloured clays ranging from beige, brown, yellowish-white, reddish brown and terracotta red, as well as dark gray/blackish color. Each Pim had various versions pressed from differing block presses (Block Mae Pim). The different animal steeds found in the vavious models of the Pra Pim Pra Putta Jao Pratap Sadtw amulets Wicha LP Parn - LP Ruesi Ling Dam, have specific powers; 1. 'Paya Krut' (Garuda), possesses Protection, Commanding Power, and Promotion - good for Civil Servants and those is positions of office 2. Hanuman (Vanora Monkey God), possesses Maha Amnaj Commanding Power, Klaew Klaad and Kong Grapan Protection, and is good for military and police officers, or those in positions of guard, or those in need of more influence. 3. Maen (Porcupine), possesses the power to protect against poisonous animals, and deadly attacks from wild animals, and to survive deadly disasters and accidents. Good for those who travel often or have to go into the forest, the wilderness, or travel in on the road and in the air in vehicles a lot. 4. Gai (Rooster), possesses Sanaeh Metta seductive mercy charm, to enchant and win friends, customers and turn enemies into friends - this Pim is good for business and commerce. 5. Nok (Bird), possesses the power to protect by forewarning with a bird's eye view (hunches and telltale signs), and to reap strong harvests in farming, and to protect on long journeys, especially if travelling to other lands. 6. Pla (Fish), this model brings business success and growth, with increased profits, and protects on maritime journeys in boats. Recommended as a protection and Business improver for Merchant Navy officers. 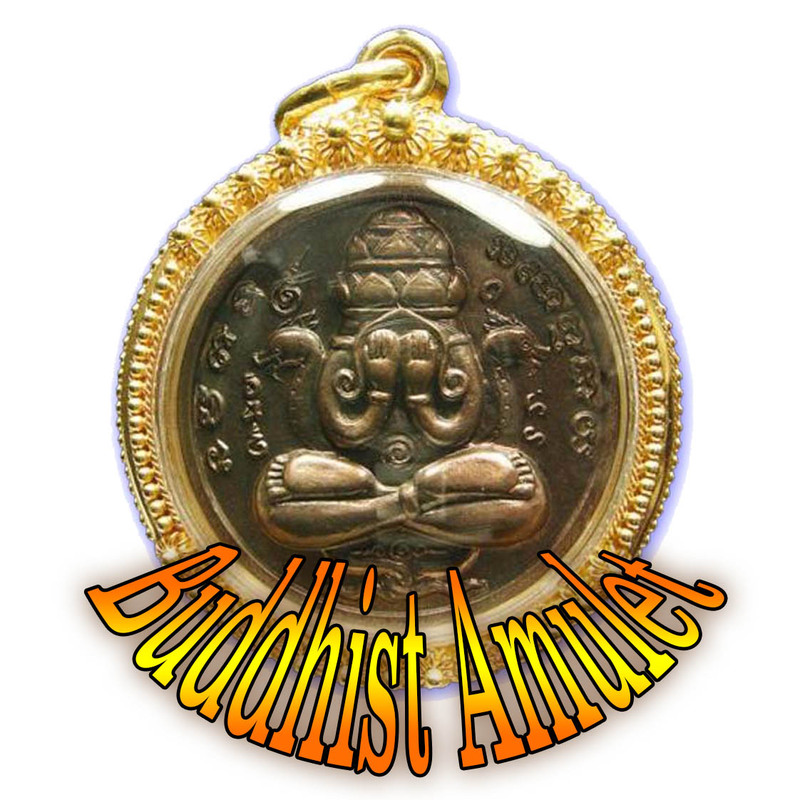 In Olden Days, Floating Market traders in Thailand highly preferred this amulet.